For the first time in many, many years, we decided to forgo getting a regular Christmas tree and make our own…out of wood. The reason became very clear as we watched our six month old kittens repeatedly try to climb an artificial plant in our TV room only to have it come crashing to the floor. 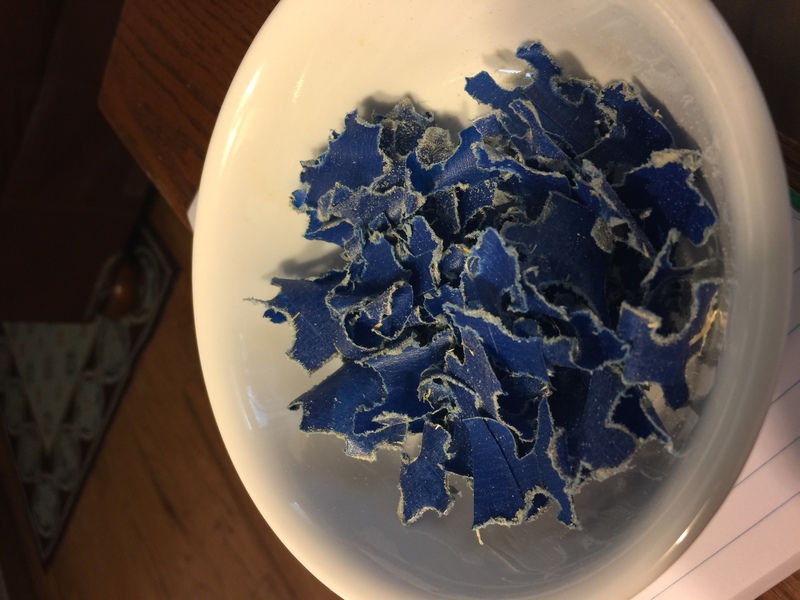 Now, we have had cats forever and we have witnessed them denuding the Christmas tree one or two feet above the floor, drinking all the water out of the tree stand and pulling the tree skirt out from under the tree to make a nest. But this year we decided to surrender to the cats and make a cat proof tree, or as one of our sons calls it, a cat accommodating tree! I acquired three 2’ x 4’ sheets of ½ inch Baltic plywood, and using scraps of wood and green deck screws, fastened the sheets together to form a 6’ x 4’ pallet for my wife to draw a Christmas tree. The plan was to construct a tree that could easily be disassembled once Christmas was over and to store the tree in the attic. I asked Jennifer to outline the tree and locate two large openings for shelves and two smaller openings to use for hanging cat play toys. When this was completed I took a jig saw and cut out the tree and large openings. I used an electric drill with a 4” diameter hole saw to cut out the smaller openings. I painted the tree with forest green paint and took it inside for Jennifer to decorate the tree. 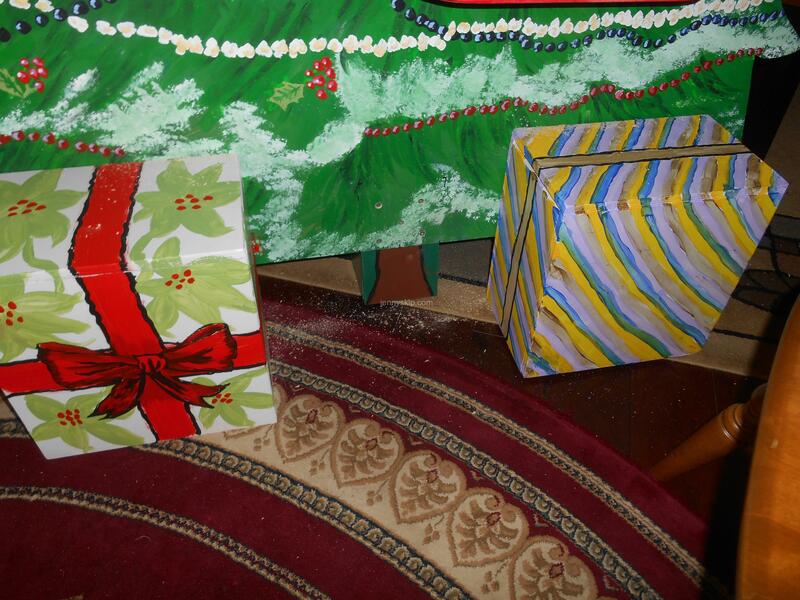 We covered the dining room table with brown paper and it became our inside work bench for constructing the tree. Jennifer will tell you that our dining room table is my favorite work bench!! Two 12” inch deep shelves were cut from the same ½ “ Baltic plywood. These had their front corners rounded off with the jig saw and painted red. Later these had a wooden strip attached to the bottom which provided a bracket for attaching the shelves to the tree. The tree was moved to the TV room and placed in front of the fireplace. The backup plan for supporting the tree was to run a board between the tree and underside of the fireplace mantel. We then loaded the tops of the boxes and shelves with treats and hung two catnip toys in front of the small openings and sat back to see what happened. 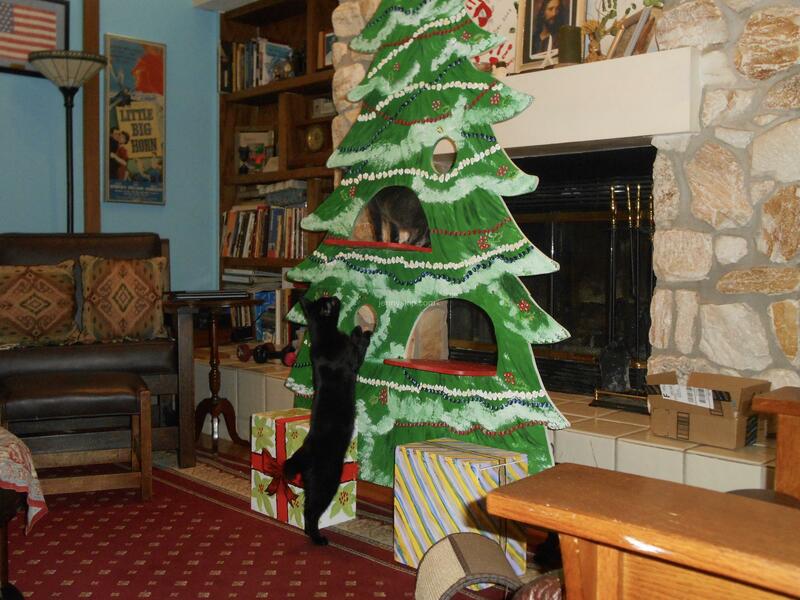 Our 16-year-old cat and the two kittens immediately put the tree to use. They climbed the front, the back and in between. The tree did not even shudder! Success! Of course, after 30 minutes the newness wore off and they haven’t been near the tree again. However, my wife and I have felt stress-free! No broken glass Christmas decorations! No throw-up from the cats reacting to the chemicals added to the Christmas stand water to extend the life of the dying tree (only kidding about the chemicals). No urine stains on the Christmas tree skirt! No 50,000 pine needles all over the floor to clog up the vacuum! And I figure that if I get one of those tree shaped things you hang up in your car that are pine scented, we can even enjoy the smell of a real tree! Next, we might even add LED lights, battery-powered so we don’t duplicate the cat-atrophy I saw on the movie Christmas Lampoon! An inspiration from one of the You Tube woodworkers: Mitch Peacock’s Hallowood 15 challenge. We haven’t risen to the level where we are confident to take on You Tube challenges yet; maybe next year. But perhaps we can participate through a blog post. 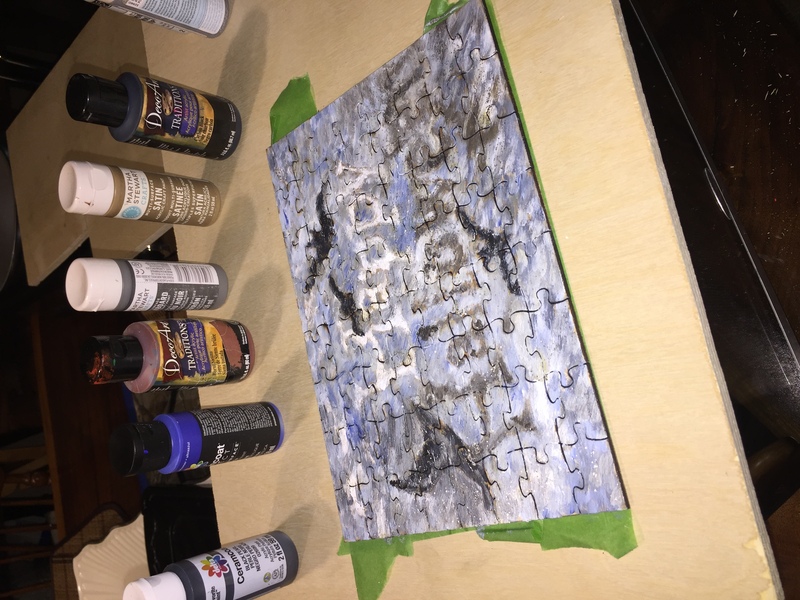 We are still learning how to use some of this new technology, so we set out to see if we could make another tray puzzle, this time with a Halloween theme. 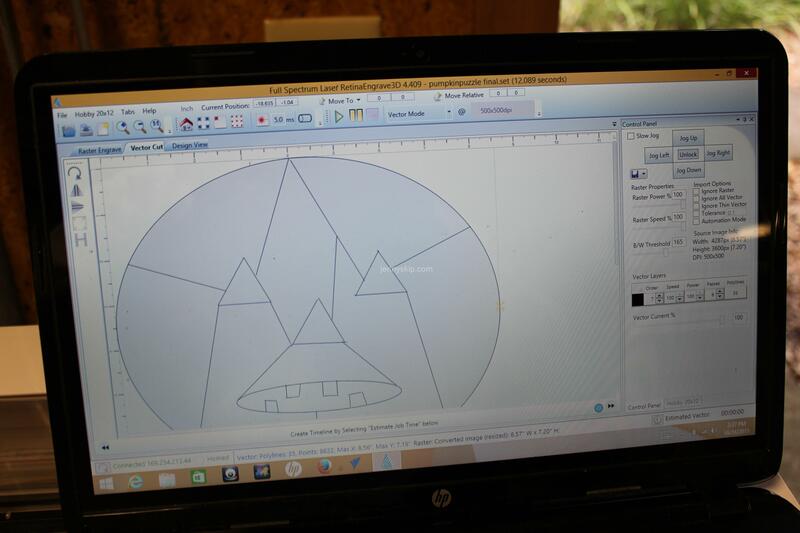 My wife drew a jack-o-lantern outline for me to vectorize and input to the laser software, so I could try cutting out a puzzle with a Full Spectrum laser. My ineptitude in dealing with all the software left me high and dry. 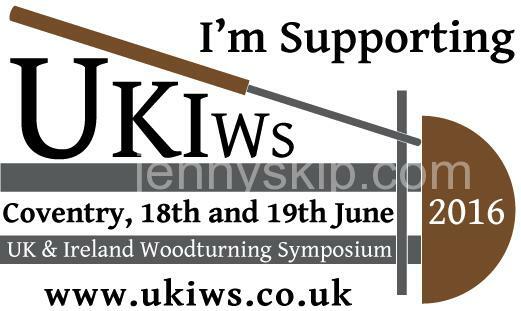 I could get the drawing scanned and saved in an XPS format, but when I pulled it into the software all I could do was get a raster file, which I could use to burn an image on the wood but not cut the wood. Evidently you need to use drawing software that lets you save your file in a vector format. So I used the drawing software that came with the laser, albeit pretty simple, and I was able to hammer out what looks like a jack-o-lantern outline with lines added for the puzzle cutouts. My wife can then add embellishments to make it look like a real jack-o-lantern. The History.com website has the story of “Stingy Jack” and many other great current and historical content related to Halloween including a video by a master pumpkin carver. The carving of these jack-o-lanterns thus finds its beginnings in Ireland and Britain in the early 19th century. Lighted gourds may date back over 700 years, but not as a Halloween practice. • Produce a drawing using a vector format. I used the drawing software that came with the laser engraver. 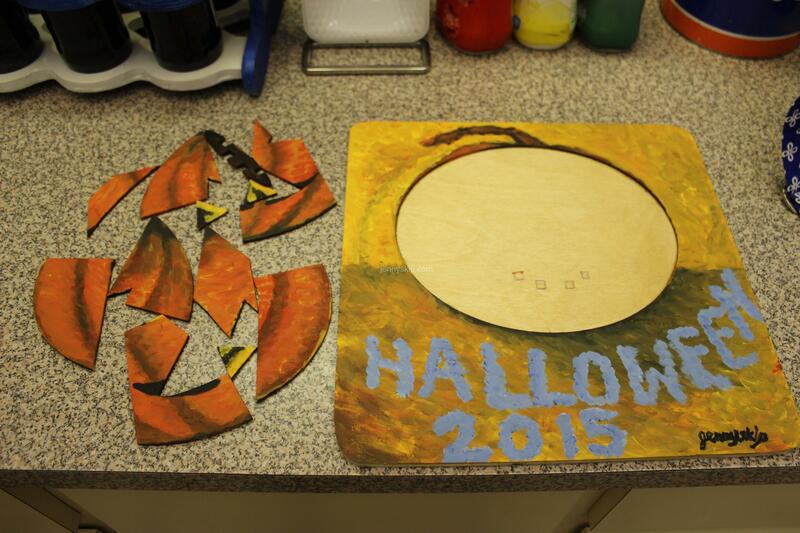 It didn’t give us a lot of avenues for creativity, so the pumpkin is pretty simple. 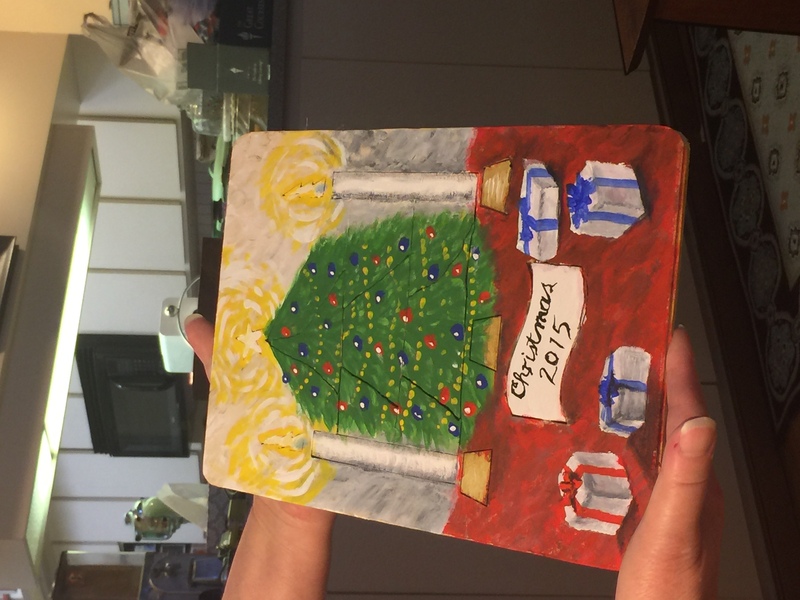 My wife embellished it, which made up for the simplicity. • Laser cut the pattern. 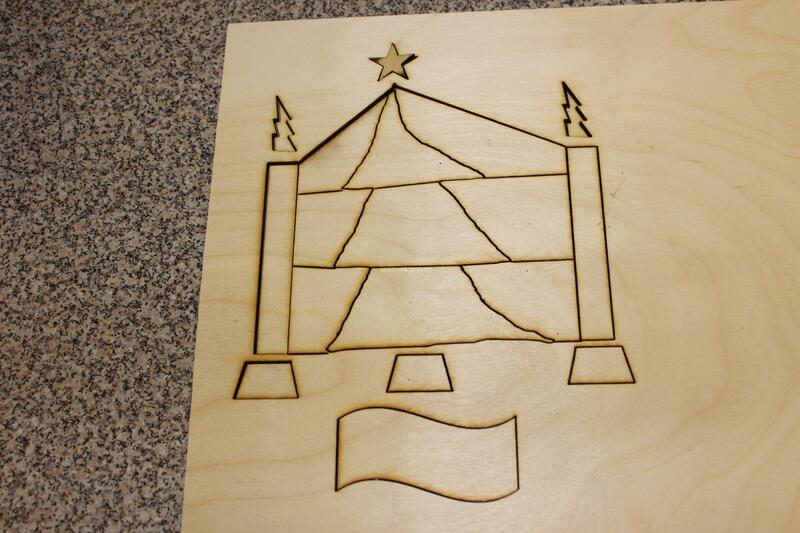 I used 7 passes for a laser setting which was perfect for cutting through the 1/8 inch hobby plywood piece. The pattern was about 8 inches by 8 inches. If I had a better grasp of drawing this pattern I would not have cut out each tooth separately. The teeth were too small to be effective puzzle pieces. 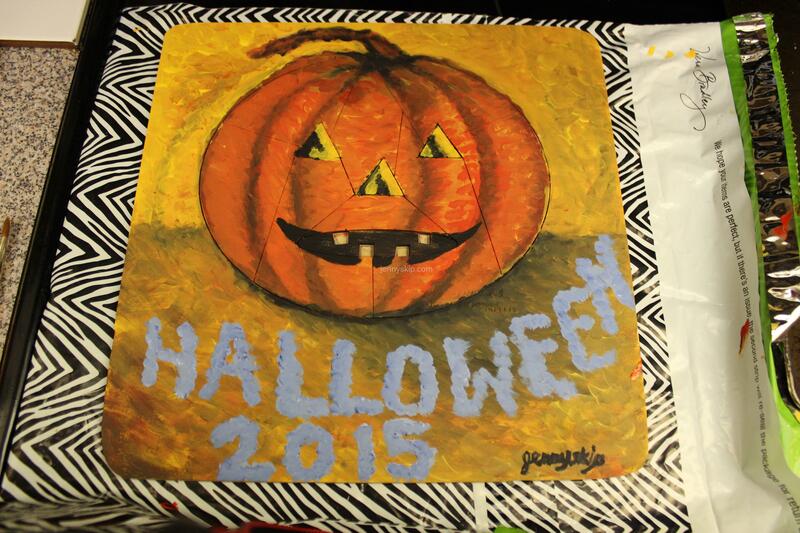 We left out the teeth and my wife ultimately painted a yellow background on the tray surface. The laser produces such a fine cut that the puzzle pieces fit very tightly in the tray. I had to do some sanding to loosen them up a little. 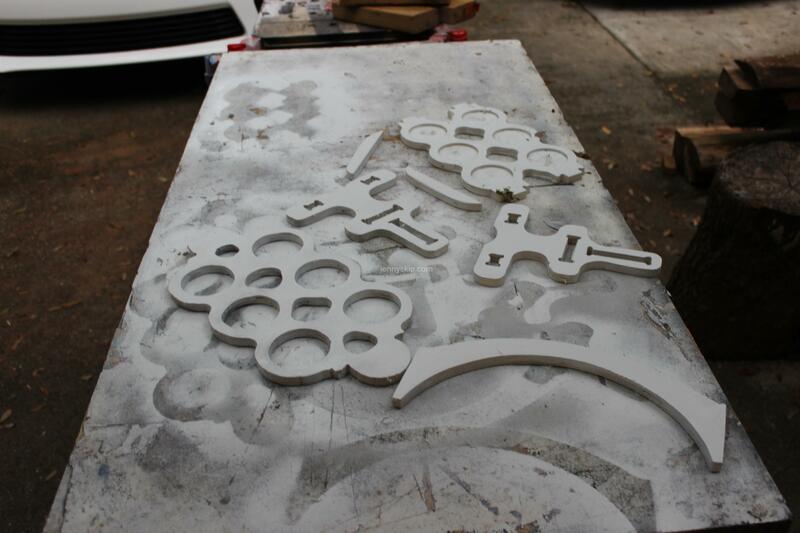 • Remove the puzzle pieces from the frame and lightly sand the pieces. Cut the frame to size and cut another piece of 1/8 inch plywood to form the back of the tray. Glue the tray back on the frame. Round over the corners, sand and apply a sanding sealer, in this case spray lacquer. Apply a sanding sealer to the puzzle pieces. • Put the puzzle together and paint. This was the tricky part. The triangles for the eyes and nose were not exactly the same; another result of not knowing what I was doing when I drew the puzzle in the vector format. So once the pieces were arranged properly, my wife came up with a way to paint the pieces so their orientation would be obvious. • Sign, date and apply a clear coat and give it to some deserving child of appropriate age. I’ve been making jigsaw puzzles for over 20 years, first for my children and now for grandchildren. 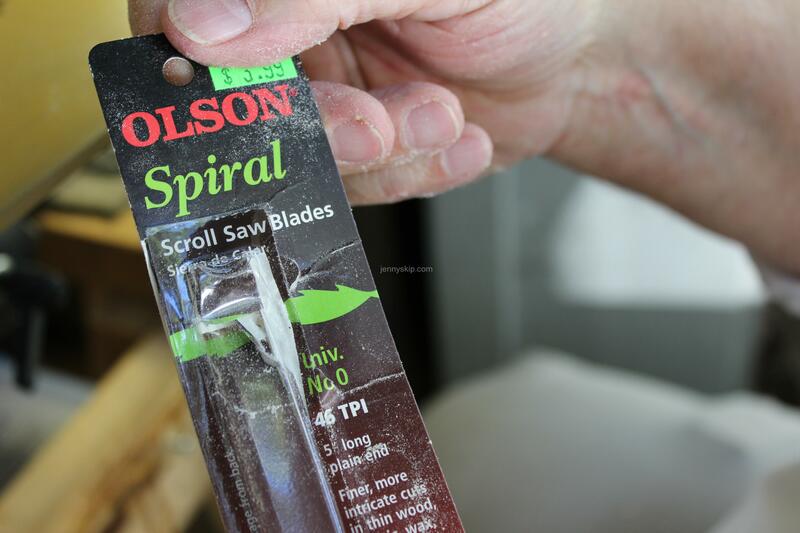 The tools I use include scroll saws and bandsaws. The first puzzles I made were tray puzzles. Sometimes I traced my children’s hands on a piece of 1/8 inch thick Baltic plywood. I would then cut out the traced hands and separate the fingers from the palms. 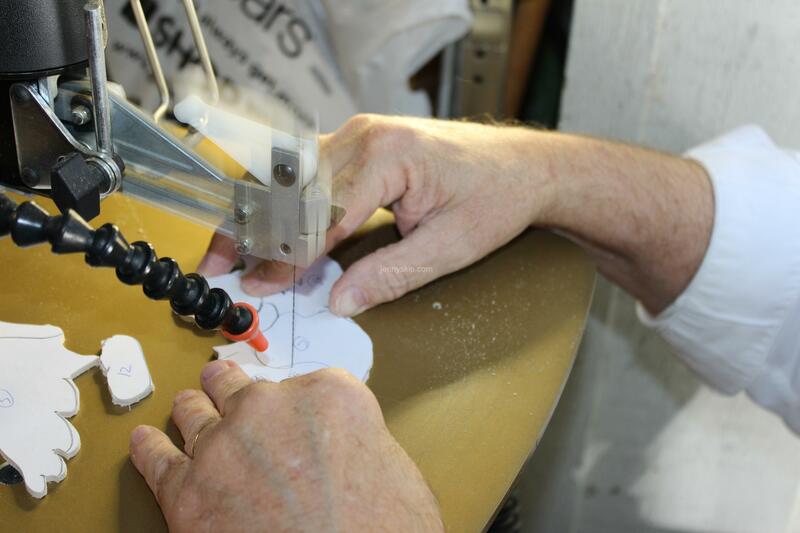 The hand shapes were cut from a square piece of the plywood, which then became a fitted frame for the hands. This frame was subsequently glued onto another square piece of 1/8 inch thick plywood to back up the frame and produce a tray to hold the puzzle pieces. I would then paint each finger a different color, as well as the palm pieces. I would then pick out a lighter color to paint the parts of the tray. Then using rub-on or vinyl letters, I would put numbers 1 thru 10 in each tray opening for the fingers. On the corresponding finger puzzle piece I spelled out the numbers: one, two, etc. 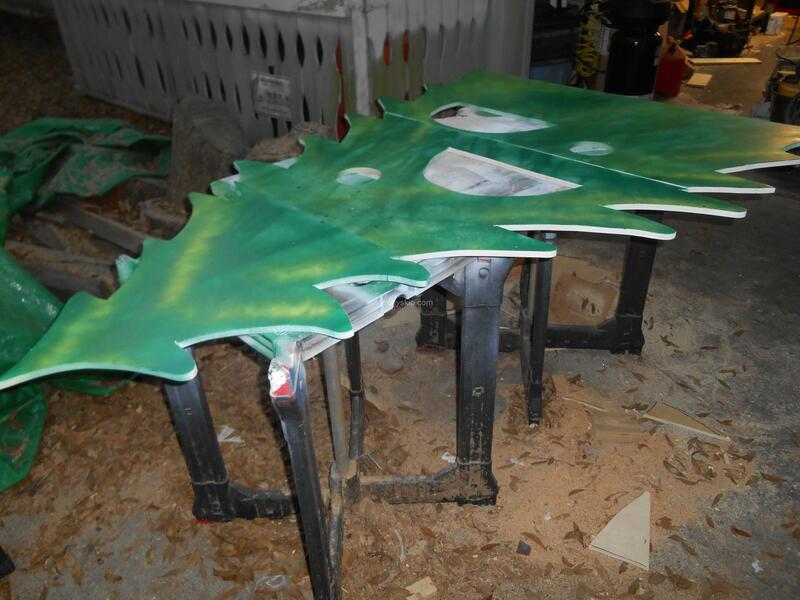 The pieces were then top coated with lacquer. All the paints were toy grade and non-toxic. However, note that the size of these pieces would pose a choking hazard for small children. ASTM F963 gives the standards governing children’s toys. As an example, a toy part must not be of a size to pass through a 1.68-inch diameter hole in a jig that is 1.18 inches thick. Now when I first made these puzzles, I had no knowledge of these standards and after all, the puzzles were for my children, and not for sale! But I don’t think the children’s mother would look favorably toward having my toys choke the children. As luck would have it, my children were old enough at the time to safely handle the puzzles I made. Another popular tray puzzle I made was a segmented, multicolored caterpillar. The caterpillar was divided into 26 pieces. Each piece was labeled with a capital alphabet letter. Under the corresponding piece the tray was labeled with the lower case letter. Since then, many other puzzles have found their way from my scroll saw to the hands of my grandchildren: free standing puzzles, interlocking puzzles and more tray puzzles. My wife has provided the artwork in many cases, while I cut it into irregular interlocking pieces, to confuse the innocent. 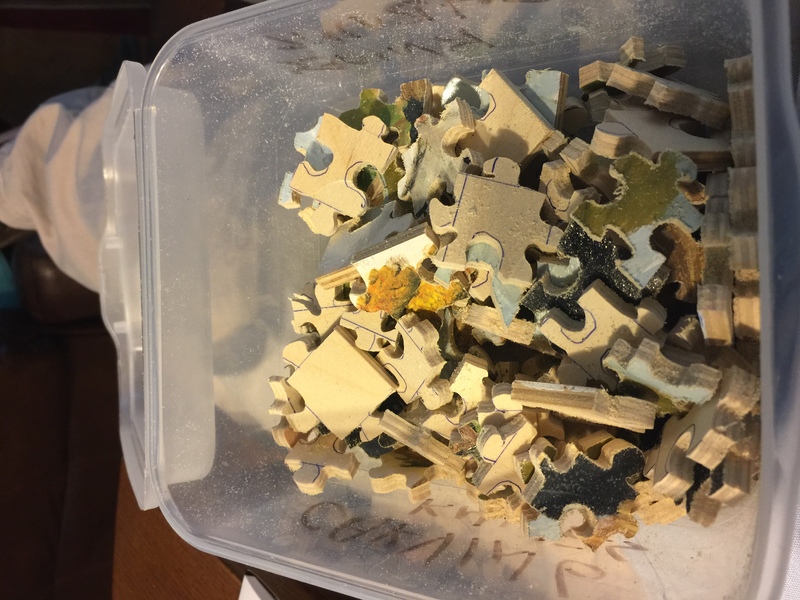 I found over time that not only was the size of the puzzle piece a function of the child’s age but the number of puzzle parts was also a function of age. The table below is a general recommendation for the number of puzzle parts. I’ve been specifically inspired by Hans Meier who is a member of the Gwinnett Woodworkers Association and who has several You Tube videos on scroll saw puzzles. I highly recommend his videos for detailed techniques on making a variety of puzzle types. 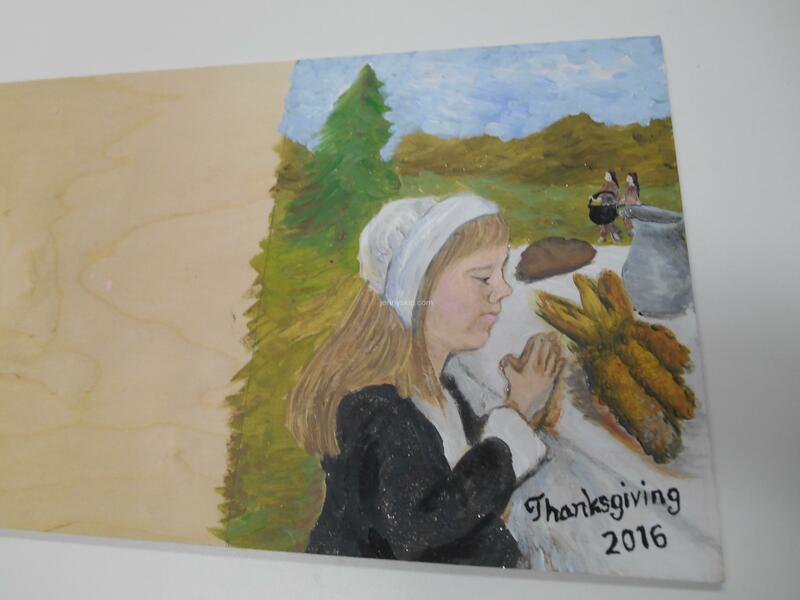 The project chosen for this blog post is a tray puzzle for one of our 5 year old grandchildren. He loves birds, fish and animals, so we chose a parrot. And even though he has worked puzzles we have made with 48 pieces, this picture lends itself to 12 pieces which is on the lower end of the recommended number for a 5 year old. 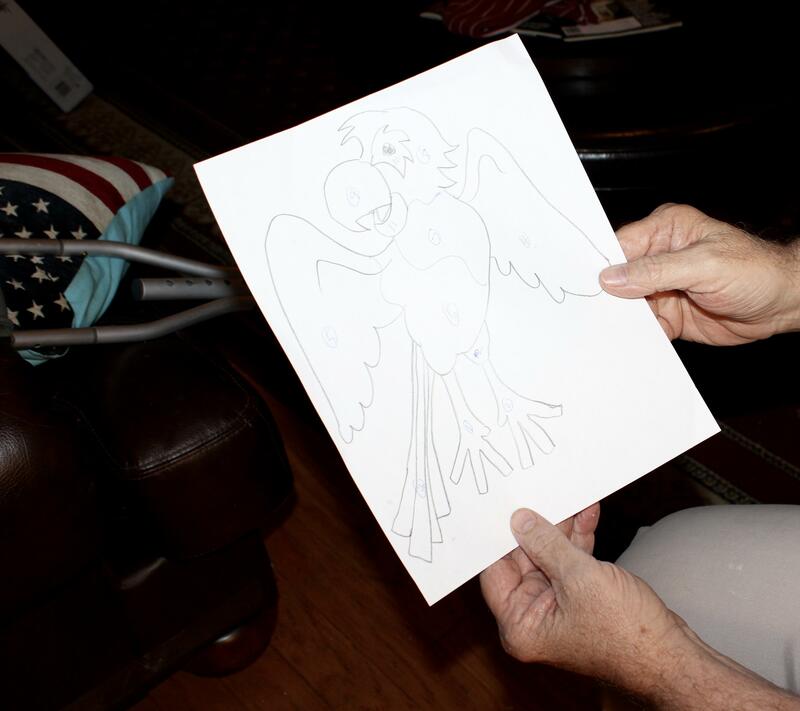 My wife, the artistic one of our blog team, sketched a parrot which I was able to divide into 12 puzzle pieces. This sketch was subsequently mounted on a 1/8 inch thick piece of Baltic plywood. 1 Select a puzzle subject. In this case the grandchild dictated the subject matter. 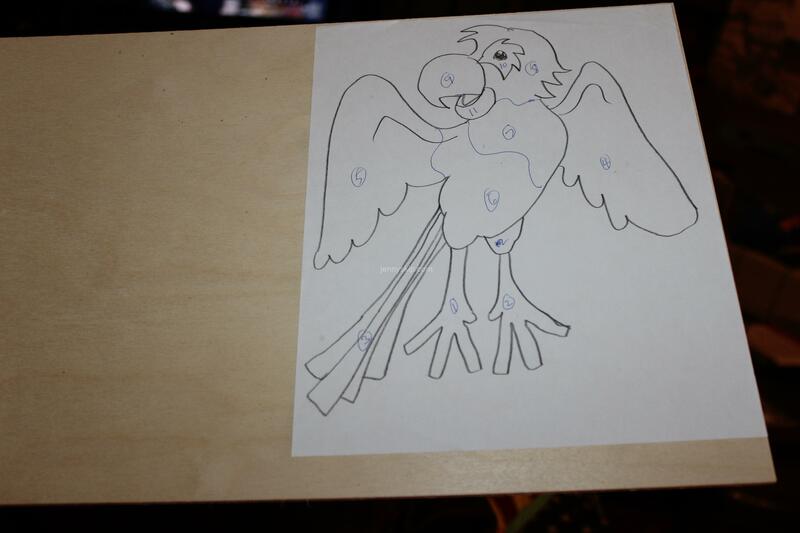 2 Sketch an outline of the puzzle subject, a parrot. 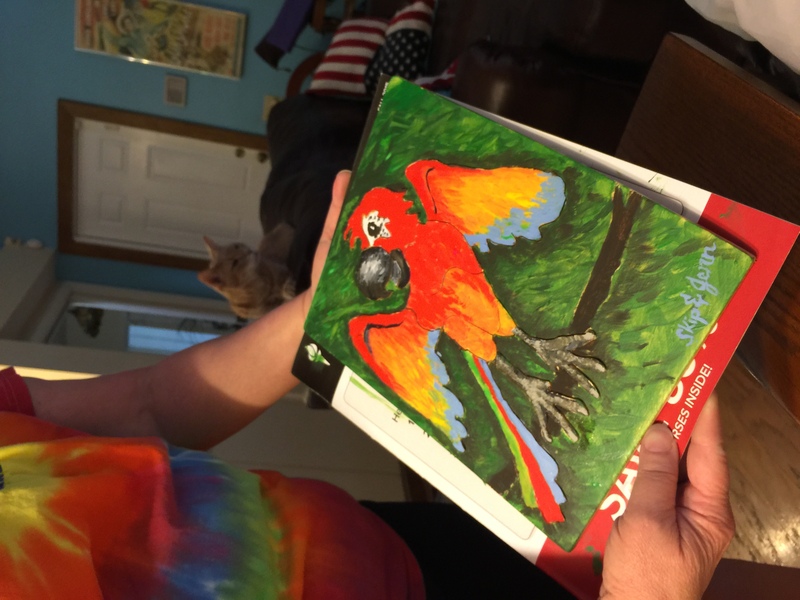 My wife sketched the parrot and selected the colors. 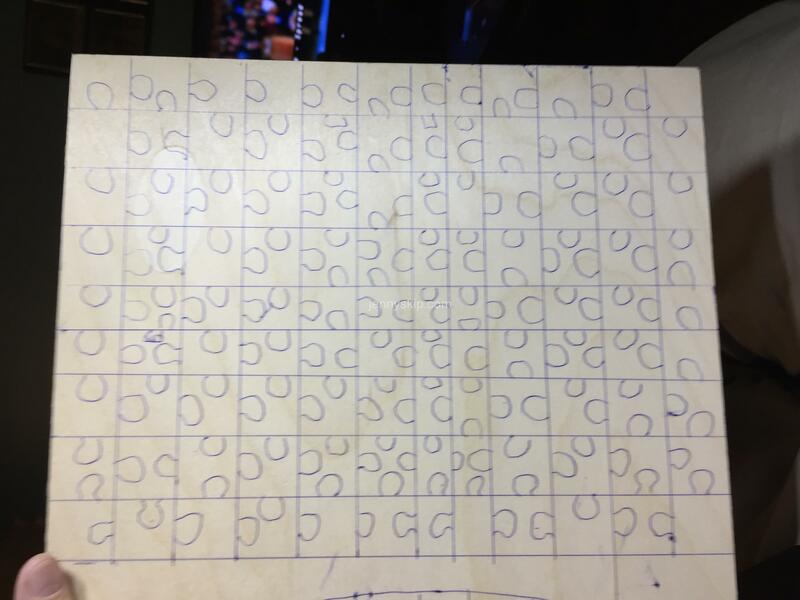 The sketch is then divided up into the required number of puzzle pieces attempting to select areas of the figures that will either make it easy or difficult to solve the puzzle. It’s important to consider the size of the pieces. 3 Use contact spray cement to attach the sketch to a suitably sized piece of 1/8inch thick plywood. 4 Drill a starter hole in the sketch with a 1/16 inch diameter drill bit. Think about this location. The object is to be able to completely cut out the whole figure from the board, leaving the remainder of the board as the frame for the puzzle. 5 Using a number 0 46 TPI spiral scroll saw blade, the outline of the subject (in this case the outline of the parrot) is cut out. 6 Once the subject has been removed from the frame portion of the board, the subject is cut into pieces. For the parrot puzzle, 12 pieces were selected. The body parts of the parrot were selected to be parts of the puzzle. Several miscellaneous cuts were included to add some challenge to solving the puzzle. 7 Use mineral spirits or a heat gun to remove the paper sketched pattern from the frame and puzzle pieces. 8 Lightly sand the frame and puzzle pieces. 9 Cut another 1/8 inch thick piece of plywood that will form the back of the puzzle (i.e. the bottom of the tray). Lightly sand this board. 10 Glue the tray bottom to the bottom of the frame. 11 Apply a sanding sealer to all the puzzle and tray parts and lightly sand with 320 grit sandpaper. 12 Paint the puzzle with toy safe acrylic paint and apply a clear top coat of lacquer. 13 Mail puzzle to subject grandchild and wait for kudos!! As we experiment with 21st century technology, we find that unless we put a lot of our 50-year plus brain cells to work, this new technology will often move us backward, in lieu of forward, with our craft. In keeping with our blog’s theme, we decided to take a 19th century brew and apply a 21st century twist to it. We love root beer. One of our children really loves root beer (at one time he actually placed 99 bottles of root beer on a ledge in our kitchen). Another son spent 2 years in the UK, where there’s not much root beer for sale. We bought some 2-liter plastic bottles of Mug Root Beer from Wal-Mart and spent about 10 times the price of the soda to ship it over to him. While my wife set out to explore the history of our favorite root beer, IBC root beer, I set out to construct a beer-of-the-root tote. 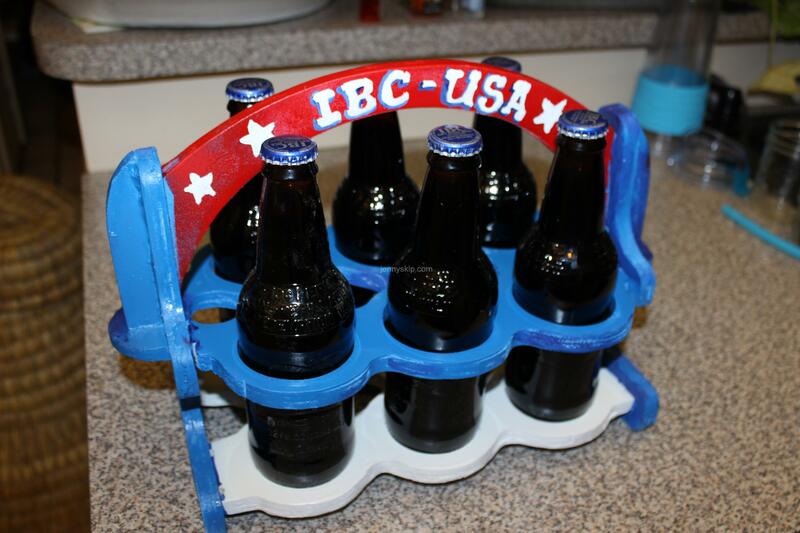 Many of my favorite You Tube woodworkers have designed and produced beer totes on their channels. Not being a beer drinker, in the purist sense, I’m not sure why you really need a beer tote. From what I have seen, beer bottles usually come from the store in a nice cardboard tote. In fact, even our IBC root beer comes in a nice cardboard tote. But I digress… on to the application of 21st technology to construct a wooden root beer tote. 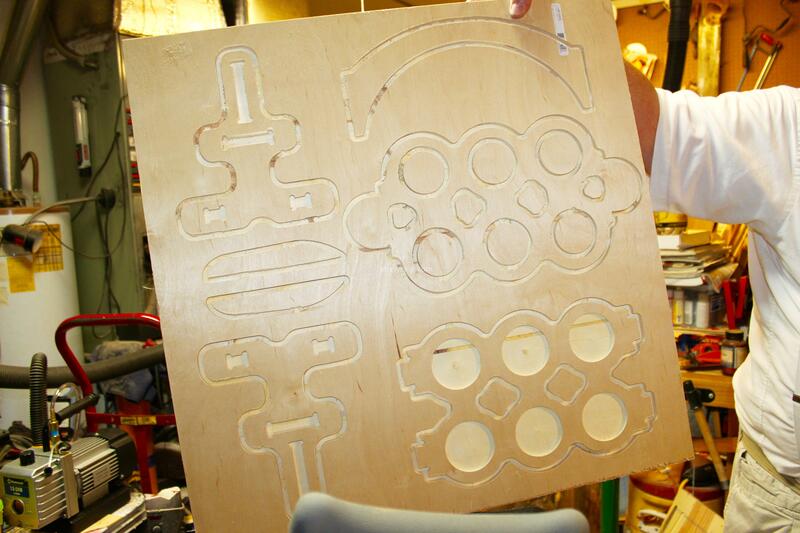 As luck would have it, I found a CNC model of a beer tote on the Vectic web site. 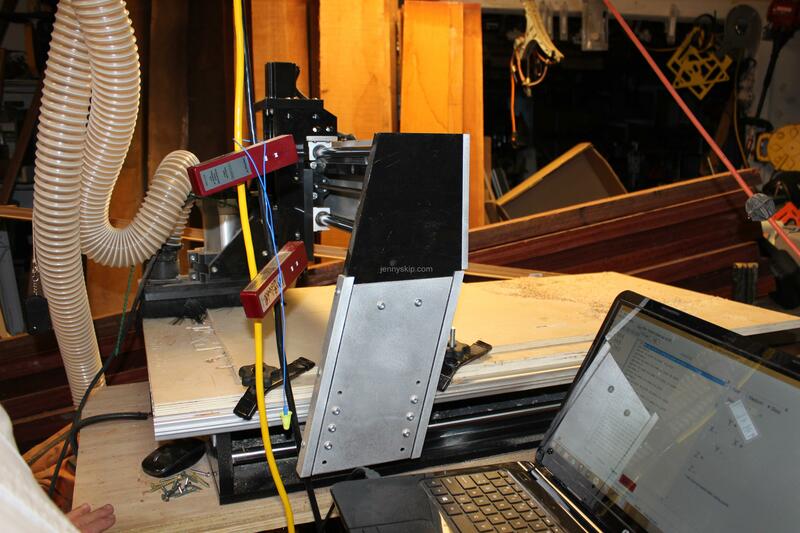 The model was complete and provided the g-code to run our Shark 3.0HD CNC machine. The model called for a 24-inch x 24-inch board, in my case a piece of 0.45 inch thick Baltic plywood. I anchored the board to a sacrificial board on the CNC machine, loaded the g-code and pressed go. As a side note, I did check out the tool paths to make sure I had the correct router bit installed, a ¼-inch end mill, and that I had the right cutting depth set for the plywood used. When the CNC machine had done its job, I separated the pieces and performed a dry fit. This is where my lack of close attention to details caught up with me. First, I had somehow neglected to include the cutouts for the wedges that were designed to hold the tote together. This problem could be overcome with some strategically placed glue. So after a dry fit , I added a little glue, sanded the tote and applied a coat of white primer in preparation for my wife’s 19th century enhancements. However (the eraser word) another synapse short-circuit became apparent when I tested the fit of the IBC root beer bottles. They didn’t fit!!! Evidently they are larger in diameter than an average beer bottle. After some serious hammer applications and some significant trial and error with the oscillating spindle sander, the bottles fit. The tote was reassembled and a coat of red, white and blue paint was applied. My wife added the finishing touches. Root beer was popular in 19th Century North America. A tourist back then could find root beer throughout the country, but it wouldn’t necessarily be the same drink from town to town. The root used to make the concoction might be sarsaparilla, burdock, dandelion, or sassafras (real sassafras roots and bark were banned by the FDA in 1960 so now artificial sassafras flavoring is used). A foaming agent could be added, along with spices such as hops, anise, ginger, or many other choices or combinations (see Wikipedia’s article for the whole story). We remember having homemade root beer at Halloween parties in the days of our youth, made memorable with the addition of dry ice, so it looked like a smoky, spooky potion! If you’re feeling adventurous, you might want to try Dr. Fankhouser’s Homemade Root Beer tutorial. It’s powerful stuff, so take care! Root beer? Check. Root beer tote? Check. Now we have to figure out where to tote the root beer.